The New Horizons canal boat offers trips designed for people with disabilities and relies totally on volunteers from the local community. 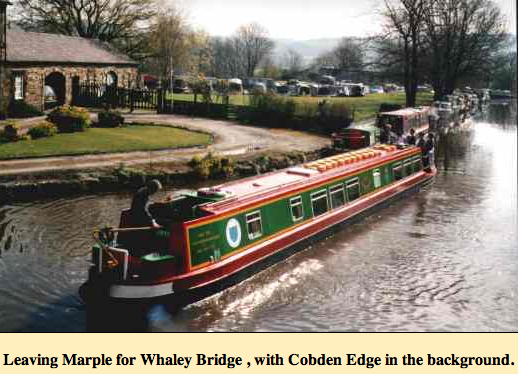 A volunteers day has been arranged on Sunday 7th April 2013. If you have a few hours to spare, would like to know more or can donate something for a tombola or raffle you would be very welcome. SMBC has launched a consultation on budget cuts for parks and open spaces for the financial year 2014-15. No longer employing people with any horticultural knowledge to look after flowerbeds, trees, shrubs and parkland. Removing instead of repairing or replacing broken play equipment. Removing instead of repairing or replacing broken fencing, seating, signage, and other street furniture. Picking up litter in parks no more than once per week. Fewer staff based at specific parks (this will almost certainly impact Marple Memorial Park's staffing). Removing support to Friends of Park Groups, leaving them to try and get on with a bigger work load on their own. A cessation or reduction in the frequency of hedge trimming, cutting grass, removing graffiti, pruning, weeding and maintenance of parks. 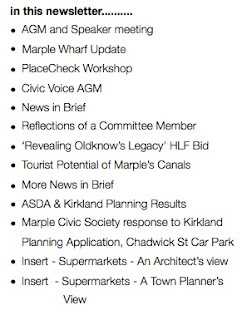 The ASDA planning application for the Hibbert Lane College site and the Kirkland planning application for the Chadwick Street car park site went before the Stockport MBC Planning and Highways Committee on Friday 1st March 2013. 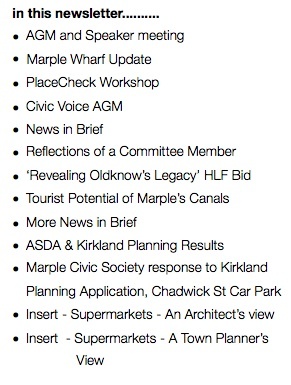 The ASDA application was refused planning permission and the Kirkland application was granted. Although ASDA has been refused planning permission by the Local Planning Authority (SMBC) they may appeal the decision.